Fall is here!! Vibrant colors are exploding around us and we are entering a season of blessed abundance. For some, the new season brings a fresh perspective; for others, autumn activities include candy eating, family get-togethers, and celebrating the holiday season. As Christians, we are called to be the hands and feet of Christ. We are called to love one another and treat others as we would want to be treated. As United Methodists, we have been called to action to help our churches and communities in times of need. As members of the New York Annual Conference we have a duty and responsibility to help our brothers and sisters through struggle, crisis and disaster. Super Storm Sandy barreled into the east coast on October 29, 2012. With the second anniversary fast approaching, moving forward towards recovery means taking a look back. The New York Annual Conference Sandy Recovery Ministry continues to be one of the leaders in the recovery efforts taking place throughout the New York/Connecticut regions. But how did we begin the process and where do we go from here? The initial relief stage of the storm, brought out teams from all over the region to help muck out homes. Massive cleanup efforts took place in the five boroughs, Long Island and Connecticut. Gutting and debris removal were constants and kept volunteer teams busy. The physical damage was obvious and disturbing. People left their homes with the clothes on their backs, often returning nothing but devastation and loss. While there are thousands of families still in need of assistance, the New York Annual Conference has been at the forefront of the recovery effort. To date, the New York Annual Conference is working with over 20 other faith-based and non-profit organizations. Since January 2014, the NYAC has coordinated more 15,000 volunteer hours, and through generous grants from UMCOR and the American Red Cross, as well as United Methodist congregations, has assisted 400 families in their recovery. With this support, our Sandy Recovery ministry has funded projects and direct aid to clients in excess of $1.5 million. Statics are impressive, but what about the whole story? 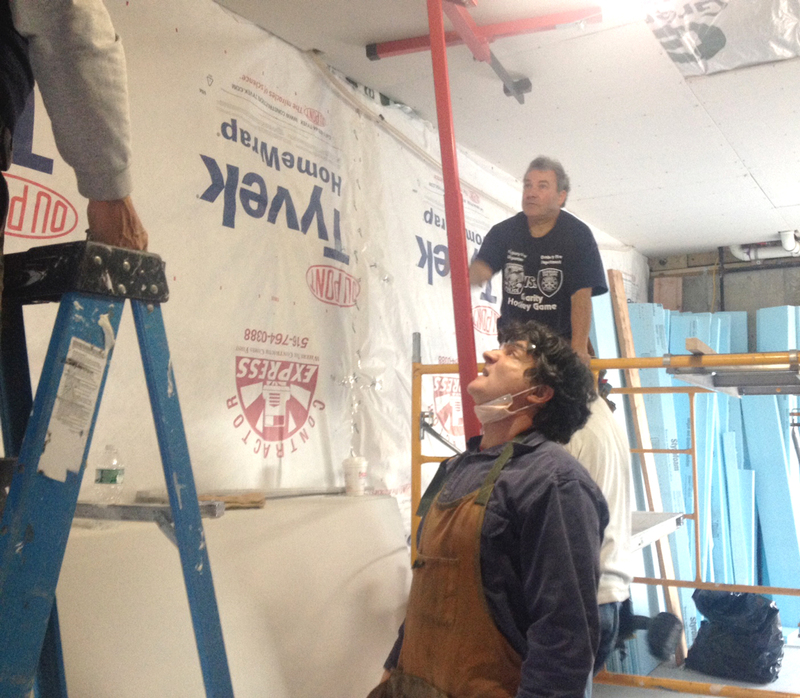 The NYAC Sandy Recovery Ministry is not only about the physical. Our ministry takes a holistic approach to the recovery process. The stories, struggles and heart of the survivors are what inspires the team, as well as the volunteers. In Connecticut, the New York Annual Conference coordinated the “House in the Box” program that helped to assist survivors with furniture needs, including beds and sofas. This program also helped to furnish household items such as cookware and basic dinnerware. Work continues to move forward in the five boroughs, helping families repair their broken homes and renewing their broken spirits. Super Storm Sandy has come and gone. Two years have passed quickly, but the effects are long lasting. There are still families that have not returned to their homes. There are families awaiting grants that live in squalor for fear of losing assistance. There are families who have picked up what was left and moved away, leaving years of memories and traditions behind. What does this mean for our New York Annual Conference? We are still here and still working toward recovery. We are also looking to the future and to do that, we must learn from the past. Preparation is essential. As a conference, we would be remiss to not take what storms we have experienced and use the knowledge we have for our future. As we enter this season of abundance, the New York Annual Conference Sandy Recovery Ministry would like to thank all of the volunteers who have participated in our program and those who have supported us throughout the effort. With that said, there is much more work to be done and we are not done yet!! Each conference is responsible for the natural disasters that happen within their boundaries. We are still in need of volunteers and more support. There are many ways that you can still help. With projects ramping up in Connecticut and Queens, and projects continuing in Brooklyn and Long Island, there are opportunities to volunteer. Go to our web site for details on how you can take part. Be the blessing: We need skilled and unskilled volunteers for projects that are coming up and continuing throughout the affected areas. Please go to our website for details! !